Already Registered? Go Directly To the JVTools Page By Clicking Here! And inside this book your readers are going to learn this EXACT formula! The best part? Just move FREE copies of the book and earn up to $335.50 commission PER BOOK + HUGE Prizes (Porsches, Mustangs, Fiats, Rolexes, Apple Products & so much more)! 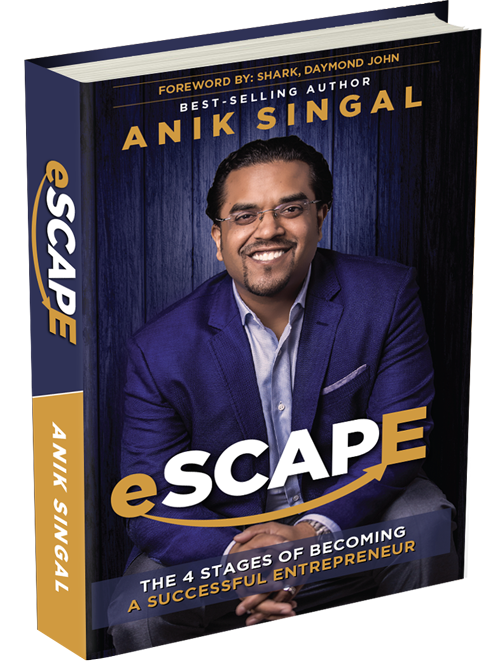 The Main Product: Your customer will get a physical copy of my brand new book, eSCAPE: The 4 Stages To Becoming a Successful Entrepreneur. We are mailing these INTERNATIONALLY! You will have 3 weeks to sell as many copies of this book as you can! Upsell #1 is our brand new course called “Millionaire Mentor.” This is an amazing VIDEO SERIES where I literally mentor someone through the process of becoming a millionaire! Upsell #2 is my BRAND NEW Masterclass that I’m releasing in September — it’s called “The eSCAPE Masterclass” — This is an 8 WEEK intensive course that they take with me guiding LIVE Classes, weekly. They will be getting a STEEP discount for buying this during the launch! Earn up to $238.50 in commission just for this one product! Downsell #2: If the customer chooses no to our BIG discount on the Masterclass, we will then allow them a chance to STILL grab the big discount by going to a 3 payment plan at just $177! The bottom-line is that we’ve got an amazing funnel and even more amazing PRODUCTS to back it all. So, rest assured, your subscribers are going to be well taken care of! But, now let’s talk about the FUN stuff, ready? But, we’re not done yet! Contest #2 is even BETTER — This one is a “Control Your Own Destiny” Contest in which your own sales determine what you win and you’re GUARANTEED that prize. To qualify. All you have to do is give away just 10 BOOKS! Now, with over $100,000 on the line — I want you to know the FINE-PRINT up-front! NO NEGATIVE MARKETING — prizes 100% taken away — no discussion. That’s it — nothing too bad right? Just fair stuff!